The Austrian pine is an extremely tolerant pine of adverse soil conditions and air pollution. It is often planted in parks, along streets, in residential landscapes, and as farm windbreaks. Landscapers use the dark beauty of these trees for backdrops, but it is also an excellent specimen tree because of its leaf pattern. Young trees are pyramidal in shape, but become oval with age and, on some sites, flat topped. Noted for its dark, rich green foliage, Austrian pine provides a pleasant contrast with other plants. 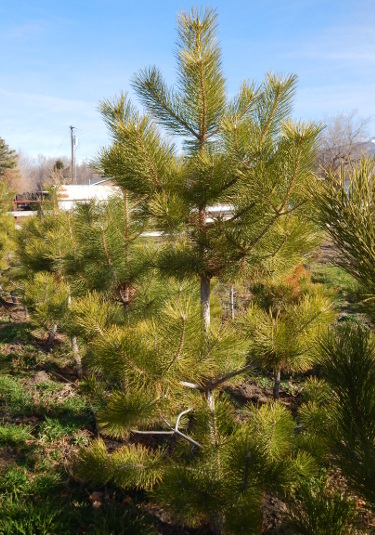 It’s one of the best pine trees for sale in Utah. Why Use Pine Trees in Landscaping? Pine trees are great for landscaping for many reasons: shade, privacy, and longevity being a few of them. Because all of our pine trees are locally grown they are guaranteed to be able to withstand the elements. Many of them are native to Utah so they have centuries of built-in resistances to the elements. They’re no strangers to high winds, extreme temperatures, and arid climate. Most of our pine trees are very bushy, which make them excellent choices for privacy trees. They are very cost-effective, much more so than fences. They’ll continue to grow year after year, naturally heal themselves, and only take up minimal amounts of water. They also grow very large, some of them up to 60′, which make them great choices for shade and wind breaks. We get many wind storms every year, oftentimes ripping out fences or smaller trees, but our large trees are very resistant to these storms. Our trees grow fast, 12″ to 24″ per growing season, so even if you do purchase them when they’re smaller, they’ll grow quickly to provide you the shade and wind break you desire.